No need to make a negative control for your pGreenFire projects—SBI’s already built one for you. With the pGreenFire1-mCMV Negative Control Lentivector, the GreenFire cassette is driven by a minimal CMV promoter with dscGFP (destabilized copGFP, 2-hour half-life) and luciferase co-expression mediated by a T2A element. The minimal CMV promoter delivers negligible expression, and this configuration provides a control for background levels of dscGFP and luciferase expression in the absence of enhancer elements, such as the ones used in our Signal Transduction Pathway Reporters/Transcriptional Response Element Reporters. 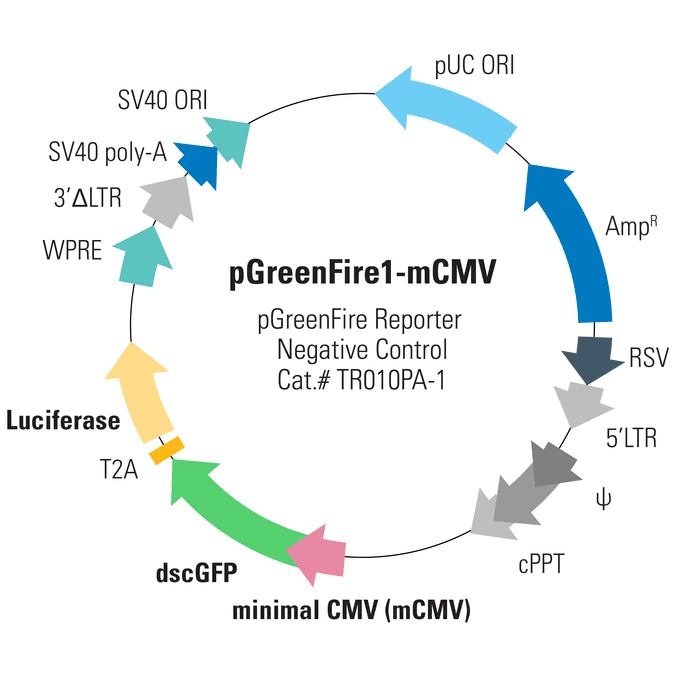 The pGreenFire1-mCMV vector is also available with constitutively expressed markers to simplify cell line construction—EF1α-neo (Cat.# TR010PA-N) and EF1α-puro (Cat.# TR010PA-P). All versions of this lentivector are available as lentivector or pre-packaged virus.